Watch the moment a young golf fan got more than he bargained for when he approached Rory McIlroy for a high-five at the British Masters. 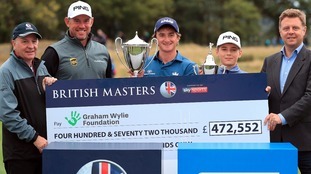 The British Masters has brought record-breaking crowds and stunning golf to the North East during an unforgettable week. Organisers say they are delighted with the turn out, having had over 60,000 people come to watch world class golf in the region. Day 2 at the British Masters Golf at Close House- Tyrell Hatton has had two blistering rounds and is 3 clear at the top of the leaderboard. The Benidorm actor was taken seriously ill last year. He's now back in the north east raising money for fellow actor Dave Whitacker. Hartlepool golfer Graeme Storm beat Rory McIlroy to the South African Open - his first European Tour title honour in 10 years. Did you know that the same person who designed the Masters Golf Course in Augusta also designed the South Moor course in County Durham?